Coloriasto: The Art of Painting. 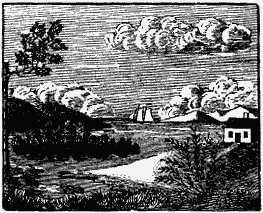 Having painted the space above the horizon, as before directed, the practitioner may proceed to mature the principle design for the work, as will best accomodate the situation and circumstances; and the outlines of this design may be drawn upon the walls, with a small brush, attached to the end of a rod or staff two or three feet long; the brush being dipped occasionally in dilute sky-blue. As a general rule, a water scene, - a view of the ocean or a lake, - should oneupy[?] some part of the walls, where there is sufficient space, and where such design will be seen to advantage. Other parts, especially over a fire place, will require more elevated scanes, high swells of land, with villages or prominent and elegant buildings. On the more obscure sections of the walls, especially such as are expected to be partly obscured by furniture, high mountains, with cascades or farm-hills may be represented. Small spaces between the windows and the corners, may be generally occupied by trees and shrubbery rising from the foreground and without much regard to the distance. The designs in this work, are usually classed in what is termed five distances, the first of which is called the foreground, and occupies the lower section, and is based on the dadoe line. The trees on this ground are usually drawn from three to six feet in height, and other objects in proportion. The second distance, (indicated by the cottage in the cut) generally includes all objects which are near enough to admit of full natural colors in the painting, and is the proper distance for representing, hunting, military, or sporting scenes. Forest trees on this distance are ordinarily drawn siz to twelve inches in height. The third distance (indicated by the island) is that in which objects are drawn on a scale of about one inch to ten feet, and in which the objects appear somewhat obscure by the distance. The fourth distance, (corresponding with the highland cape) is that in which the objects appear in a fain bluish tint, and on a scale of an inch to fifty or sixty feet, - the trees being hardly distinguishable. The fifth is the extreme distance, in which mountain and highlands appear of a palve blue, even in clear weather. It is not uncommon for one distance to extend gradually into another; but as each general distance, requires a peculiar set of colors, it is most convenient to class them in this manner. A correct knowledge of the general principles of this branch, is more important and more difficult to acquire by the learner, than the art of drawing and finishing individual objects. We shall proceed to describe the process of compounding and applying the principal foundation colors.